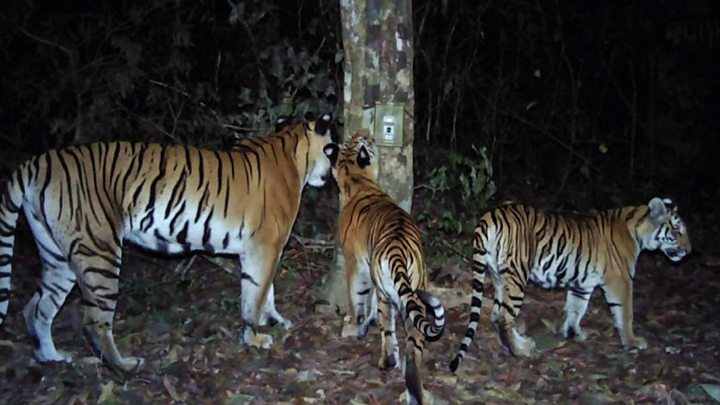 A new breeding population of the critically endangered Indochinese tiger has been found in a national park in eastern Thailand, conservationists say. Camera traps discovered a small population with at least six cubs in the jungle. Poaching and the loss of habitat has reduced the global population of the sub-species to under 250. Conservationists said the success was due to the stepping-up of anti-poaching efforts in Thailand. Counter-trafficking organisation Freeland and Panthera, the wild cat conservation group, conducted the survey with the support of the Thai park authorities. Until this find, only one other breeding population of Indochinese tigers - also in a Thai national park - was known of. "The extraordinary rebound of eastern Thailand's tigers is nothing short of miraculous," said John Goodrich, tiger programme director at Panthera. The director of Thailand's national parks, Songtam Suksawang, said: "The stepping up of anti-poaching patrols and law enforcement efforts in this area have played a pivotal role in conserving the tiger population by ensuring a safe environment for them to breed. "However, we must remain vigilant and continue these efforts, because well-armed poachers still pose a major threat." Numbers of tigers in the wild have dwindled from 100,000 a century ago to 3,900 today, the groups said in a joint statement. Thailand was the first country in this region to deplete its forests, to such an extent that by the 1980s it had banned logging. It was also among the first to establish national parks, but initially these were also badly stressed by illegal logging and hunting. At the time, Cambodia, Laos, Myanmar and even Vietnam had a lot of pristine forests left, with healthy populations of tigers. Tigers had declined in Thailand to the point where in the early 2000s it was thought they were very small and fragmented. But since then, massive illegal exploitation has badly depleted the forests and tiger populations in the other countries - even Myanmar - to the point where Indochinese tigers are believed to be extinct in Cambodia, down to just a handful in Laos and Vietnam and with unknown, but almost certainly greatly reduced numbers in eastern Myanmar. Meanwhile, improved conservation strategies have allowed the tiny population of Indochinese tigers in Thailand to recover in some areas, although they have disappeared in others. So, with its reasonably well-run national parks, Thailand finds itself unexpectedly the last stronghold of the Indochinese tiger.